Type of Plant: This is a dwarf evergreen in areas where it’s hardy – zone 7-9. It has a columnar growth habit and lime-green, fragrant foliage. In the Northeast this plant is sold as an indoor, holiday plant. Why I Love This: The bright foliage is perfect for indoor displays at the darkest time of the year. But I also love that this plant is easy to grow indoors – and it’s easy to keep alive from year to year if you put it in a larger clay pot when you first buy it, and place it outside in part-sun over the summer. A Word to the Wise: This is a warm zone 7 plant so absolutely NOT hardy in the Northeast. Believe me, I’ve tried planting it outside and it’s never lived, even in the warmest of winters. But it’s worth growing inside, whether you keep it from year to year or not. 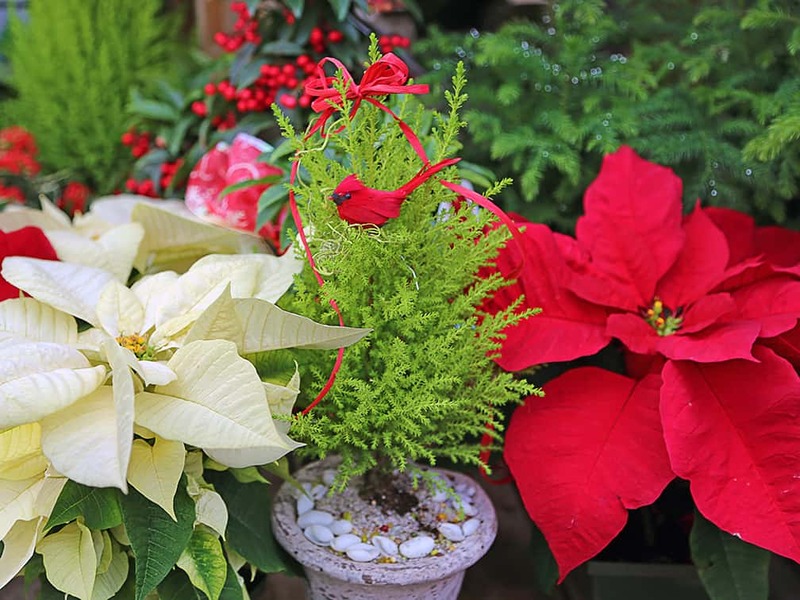 Goldcrest cypress is perfect for combining with red Poinsettias or other holiday plants.